It's August already, wow what?! Where has the Summer gone! I have a lot of exciting outfit posts planned throughout August though, fashion has been super neglected on my blog lately and I can't wait to share with you all some amazing looks I've put together. I also receive my A-Level results August 13th, I definitely have mixed emotions about that one! But anyway, July! 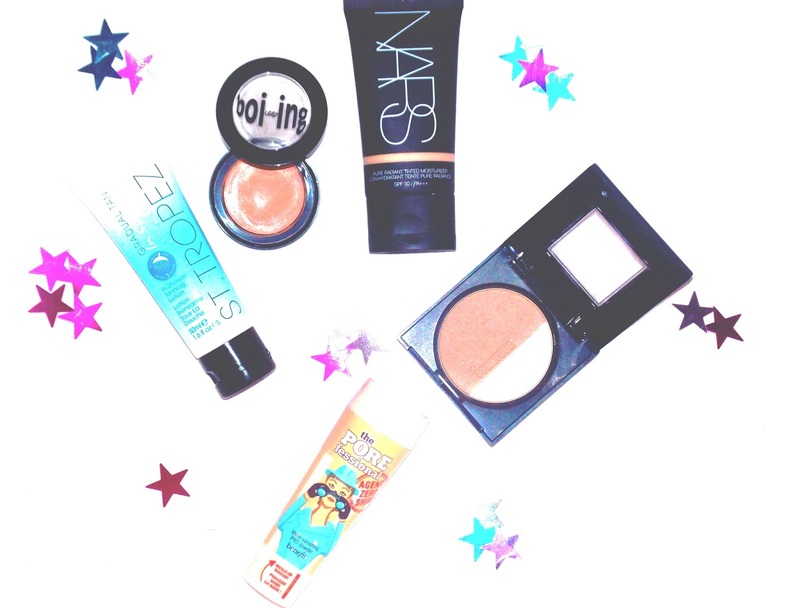 I've a mixture of some new and old beauty favourites this month, I hope you enjoy! Maybelline Master SculptAlthough I only picked this up at the end of the month, I'm in love. The bronzer is super natural and to my surprise, lasted me all day! The highlighter is also a beautiful champagne silver which is never a bad choice. There isn't too much glitter infused either so no looking like Edward Cullen. Besides the fact the brush does shed, I can definitely see me using this on any weekend trips or holidays, super compact and handy. I love it. St Tropez In Shower Gradual TanI have a full review of this here which I recently posted if you want to check it out, so I won't say too much about this in today's post. But, this is super natural, virtually fragrance free and perfect for the lazy girls and first time tanners like myself. Definitely very convenient and gave me a lovely glow last minute for my trip to Nottingham this weekend. Benefit Boi-ingA well loved favourite of mine which I have began reaching for a lot more this past month. TMI but the summer brings sweat and thus breakouts. This beauty is amazing for covering pesky blemishes without making your face look 'cakey' or patchy either. Definitely my holy grail concealer for when I want to cure a spot attack. Benefit Agent Zero Shine PowderI recently mentioned this in my sweat proof make-up post which you can check out here if you wish. This powder is perfect for those long, hot summer days. Blurring pores, banishing all signs of shine and keep your face oil free all day, I absolutely love it. This also comes with a brush included which once again is great for travelling! This also is the only powder that prevents my MAC prolong wear concealer from creasing, of course another reason to love it even more! NARS Tinted MoisturiserOh my god this product!!! I have had SOOOO many recommendations from you all to purchase this in the beauty blogger chats on twitter, and I am super glad I listened to you all! For a tinted moisturiser the coverage for this is pretty good and on good blemish days I don't even feel the need to add a concealer. This lasts all day and is perfect for the summer due to the added SPF 30. The formulation of this is also super creamy which I love, as someone with combination skin it's nice to be looking oil free yet add some hydration to the drier parts of my skin.